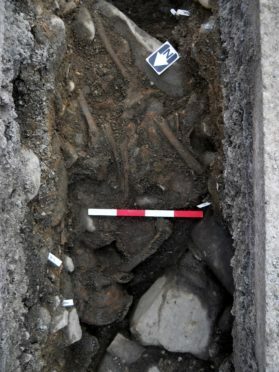 Bones, believed to date back to the 16th century, discovered as the Scottish Water project was being undertaken in the Highland village of Kingussie. Vital works to secure the water network in the village of Kingussie are now complete with developments over archaeological finds from the site expected later this year. The work, undertaken by Scottish Water in the Mill Road and High Street area of the village, was briefly interrupted due to the discovery in late November. Human remains dating from the 16th Century including skulls, leg and arm bones are among findings along with foundations of a historic chapel on Mill Road. It is believed these are linked with a pre-16th Century Carmelite friary. Scottish Water’s project manager Ailsa Shaw said: “I would like to thank residents and road users for their patience and understanding while we were working. A full report into the findings is expected later this year following the conclusion of the post-excavation analysis. Steven Birch of West Coast Archaeology, who is conducting the archaeological work, said: “The story of this site is still emerging and will continue to do so as the results of post-excavation analysis are returned over the months ahead. “What we found was the foundations of an early church, with fragmentary burials placed within its walls, as was once common practice. It’s likely this was associated with the Carmelite friary that we believe was established in the area over 500 years ago. Mr Birch believes radiocarbon dating will prove to be crucial in allowing an exact chronology of the remains to be established, allowing an insight into life in the area at the time.